As season two of Star Trek Discovery continues to get closer, Short Treks is back with an unexpectedly beautiful episode “Calypso.” With “Runaway” last week, we were feeling a bit underwhelmed. This episode has us pretty ecstatic. Especially because it teaches that the truest expression of love is letting go of the little man that walks around inside you. Olatunde Osunsanmi is back as director! With “The Butcher’s Knife Cares Not for the Lamb’s Cry,” “What’s Past is Prologue,” and “Point of Light,” I am quickly becoming his biggest fan. This man should get his own Star Trek series where he just directs every episode. The folks on the writing side are also stupidly great. This is our first peek at what Michael Chabon will be bringing to the Star Trek universe. He was tapped as a writer for the recently announced series focusing on Picard. He’s also the author of one of my favorite books, The Amazing Adventures of Kavalier and Clay. I am beyond thrilled about him coming to the Star Trek universe. And “Calypso” has exceeded my high hopes. But Chabon wasn’t alone in writing this bad boy. He tapped Sean Cochran to help him break the story. Cochran is the fella behind “Despite Yourself” back in season one, and “New Eden” in season two. Annabelle Wallis is plays the voice of Zora, and is now the voice I want my Google Home to use. She also had a role in the 2017 film “The Mummy” from show runner Alex Kurtzman. I found that movie to be unimpressive, but given that last month’s Short Trek featured the writer from that film, it seems to be a reliable well for Star Trek to mine for talent. And finally, the only character in this episode is Sash Striga as the holographic version of Zora. She seems pretty new to acting, with her only other credit being several episodes of “Letterkenny.” Unfortunately she doesn’t get any lines in this Short Treks episode, but she was still somehow damned charming. Listen in as your hosts, Jason and Joe, review the happenings of each episode on our Star Trek Discovery podcast. Released every Monday after Discovery’s release! You might wanna subscribe in iTunes. It’ll improve life and happiness. 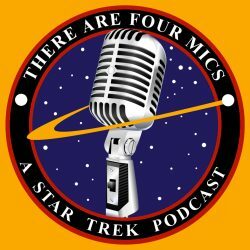 Also, check out our other Star Trek podcast that has us going through the franchise in stardate order. It’s fun.